EJI is an organization founded by Bryan Stevenson with help from his friend Eva Ansley in Montgomery, Alabama. When they begin their project, they are focused primarily on providing free legal aid for death row inmates seeking relief. They later take on projects related to juvenile incarceration, improving prison conditions, and educating the public about racial and prison injustice. They take several landmark cases to the Supreme Court. The timeline below shows where the term Equal Justice Initiative (EJI) appears in Just Mercy. The colored dots and icons indicate which themes are associated with that appearance. Ballinger-Dix, Elizabeth. "Just Mercy Term: Equal Justice Initiative (EJI)." LitCharts. LitCharts LLC, 21 Jun 2017. Web. 24 Apr 2019. Ballinger-Dix, Elizabeth. 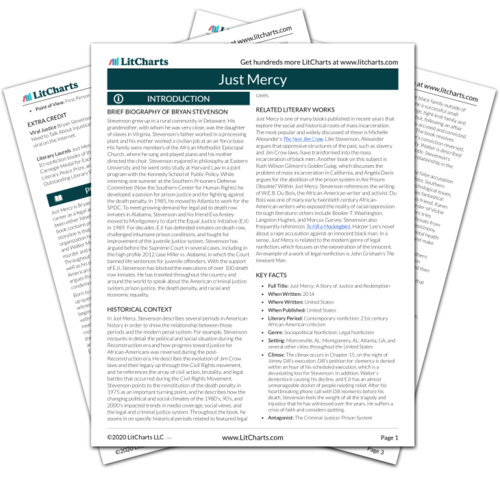 "Just Mercy Term: Equal Justice Initiative (EJI)." LitCharts LLC, June 21, 2017. Retrieved April 24, 2019. https://www.litcharts.com/lit/just-mercy/terms/equal-justice-initiative-eji.